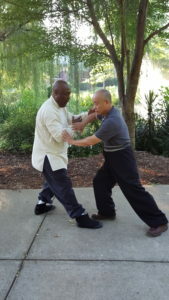 Lam Tang Kung Fu Academy has proudly served in the Columbia, South Carolina, and Lexington County area offering tai chi for over 30 years. Tai Chi Chuan translates as Grand Ultimate Fist. It sounds fierce, and it can be, but it is perhaps best known for it graceful, slow movements, and its benefits for improving health. 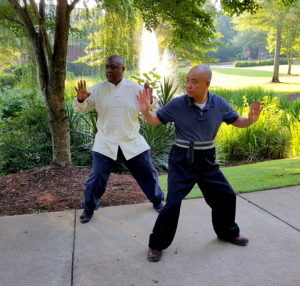 There are several styles of Tai Chi, and Lam Tang specializes in Sun style, and Wu style. Tai Chi was created as a system of mental and physical discipline which we can understand and follow, and which is based on universal principals of balance and harmony. The body must be coordinated, relaxed, comfortable, peaceful, and mentally alert. In this way you will be able to maneuver the body in any direction, at will. This will eventually lead to building the fire of internal energy and the process of internal power projection. Tai Chi is slow moving and gentle exercise that harmonizes and strengthens the body, mind and spirit. Pushing Hands is a Tai Chi exercise that is designed to heighten awareness of an opponents energy. This is a technique called “listening.” Faster movements are easier to feel and follow, but moving slowly it is more difficult to feel the energy of your partner and harder to determine their next movement. What is the difference between T’ai Chi Ch’uan, Tai Chi and Taijiquan? What does Tai Chi Chuan mean? It has been translated as ‘Supreme Ultimate Force’ but at Lam Tang Kung Fu Academy, we prefer to think of it as a martial art using the principles of Yin and Yang. What is the age range in classes? One can expect a broad range of ages from Youths to Seniors. Usually children find the movements too slow for their high energy. Do you have to be fit to start doing Tai Chi? No, in fact many of the Tai Chi movements can even be adapted to persons in wheelchairs. Many doctors are recommending patients to Tai Chi, and some individual attention may be required. Do however check with your doctor if you are in any doubt before starting any program of physical exercise. Also let your instructor know of any disability you may have that may restrict your ability to perform certain movements. We use health questionnaires to help individualize instruction if necessary. This is an exercise that is especially beneficial for senior citizens because of the many benefits for health. It is both (although some teachers teach only the health aspects)! 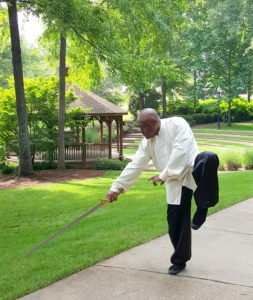 Probably 90% of people starting Tai Chi are there purely for their health, but many go on to embrace the complete art, and it is known as the hardest martial art to defend oneself against. Are classes suitable for men and women? It is totally acceptable to have a mix of men and women in a class. Because tai chi does not use force, and is a mostly solitary exercise, there is no danger of combative injuries in classes. What do you wear for Tai Chi? Lam Tang has a very simple school uniform. We require a school T-shirt and comfortable loose pants like sweatpants, and tennis shoes. I’ve heard that Tai Chi is an internal martial art? Taijiquan is one of the three Chinese Internal martial arts (Liu Ho Pa Fa). This is the main reason that it has such enormous benefit for health. The other two being Xing I Quan and Ba Gua Zhang. It is a characterized by soft relaxed movements and trained at a slower speed than other martial arts. What should I expect in a typical Tai Chi class? Qigong may be stationary or moving meditation, and practice of the Tai Chi Form. 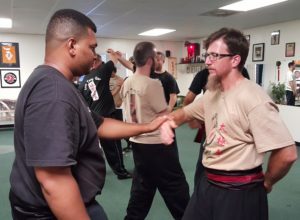 There will also be Pushing Hands (tui shou) – a two person exercise usually taught from intermediate level training. At higher levels, there are weapons forms.